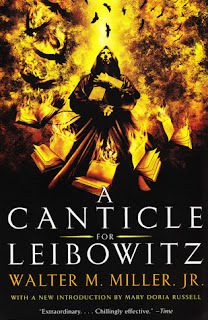 nerds of a feather, flock together: Microreview [book]: A Canticle for Leibowitz by Walter M. Miller, Jr.
Microreview [book]: A Canticle for Leibowitz by Walter M. Miller, Jr. Published in 1960, A Canticle for Leibowitz is one of the books credited with forcing the mainstream press to begin taking speculative fiction seriously. Upon publication, even if it wasn't reviewed terribly positively, it was at least reviewed in some heavyweight publications that normally wouldn't touch sci-fi with a ten-meter cattle prod. In the five-plus decades since, it has continued to make appearances on prominent lists of the Greatest Sci-Fi Books ever. To cut to the chase, reading it with fresh eyes today, it's not the pinnacle of the genre. It is, however, an engaging cornerstone of Cold War science fiction. Over the last year, and for no particular reason apart from random chance, my reading list has included On the Beach by Nevil Shute and The Man Who Fell to Earth by Walter Tevis. I realized in reading A Canticle for Leibowitz, however, that these three books together give a profound, eerie, and usually moving picture of the Cold War-era zeitgeist. Tevis' book is about an alien that comes to Earth in an effort to save his own people, but falls victim to crushing alcoholism due in part to his realization that the planet cannot help but do itself in with its rapidly proliferating nuclear weapons. On the Beach is a haunting, unshakable portrait of the post-war world, where the few Australian survivors of the nuclear wars wait for the fallout clouds to come far enough South to poison and eventually kill them all. Walter Miller's book begins several hundred years after the wars. Or, "The Flame Deluge," as the book's inhabitants refer to it. After the wars, there were few unaffected humans left, but those that remained rebelled against all knowledge, as too much knowledge had caused their destruction. The cities were all flattened, the books burned, literacy made verboten, and the outlands became dotted with tribes of murderous mutants. Seemingly the only thing that survived the transition from industrialized, nuclear-capable society to the new dark ages was the Catholic church. A Canticle for Leibowitz, like a medieval painting, presents a triptych of tales that cover some 1800 years of future history. The first story concerns a young novice who stumbles across a fallout shelter that likely belonged to "the blessed Leibowitz." 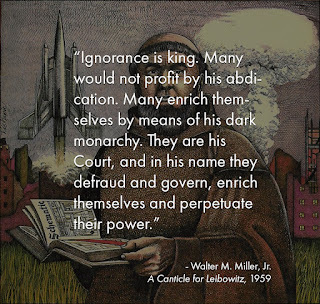 The cosmic joke here is that Leibowitz was probably a low-level electrical technician in Bell Labs or General Electric who probably worked on government contracts (and happened to be Jewish, to boot), but after 600 years he is on the doorstep of beatification. The second story takes place in essentially the second Middle Ages, when mankind has only just rediscovered science, and the monks of the Order of Leibowitz, who have been keeping the sacred documents (basic science texts and blueprints) for 1200 years, unwittingly hold the keys to scientific knowledge that predates The Flame Deluge. The final story, set some 1800 years after the nuclear decimation of the Earth, presents a futuristic setting that finds mankind capable of space travel, but on the verge of another nuclear conflict. History repeating, no less. As grim as it may be to think that we'd annihilate the entire human race out of hubris and then do it again (...and again...and again...and again...), Miller's reminder is a prescient one. When the United States is currently locked into a presidential race that is echoing the worst rhetoric of the last 100 years of institutionalized mistakes, it is a chilling, and motivating, reminder about where we were as a nation just a half century ago. This is the best of what science fiction does. Through the lens of a fantastic world, it shines a light on our own. Walter Miller's book did that in 1960, and it continues to do it today. Some of the prose, and some of the insights, are truly eloquent. That said, the book comes across as pretty solidly dated. There are, by my count, three women in the book. One of the things that the efforts of so many writers over the last few generations have shown us is that if we limit our storytelling to one group of people, or one gender, we're necessarily missing part of the story. So when I read the book today, I felt like there were a lot of good ideas that went into the world-building, and that the book presented a lot of philosophically and historically interesting notions, but I keenly felt aware that I was only getting part of the story. As much as I admired the noble intentions of the Brothers of Leibowitz, I found myself wondering often about the sisters outside of the abbey walls, and how they were navigating this post-apocalyptic future. And why did we return to a solid patriarchy? If we burned the books and plans and literacy that nearly wiped us out the first time, why did we not burn the patriarchy? The answer is probably because Walter Miller took it for granted. That's not intended as a knock on him, given the time he was writing and all that, but as a reader I was keenly aware of the fact that I was looking at "history" through the eyes of a bunch of white guys, and that there was a lot more going on in this world that I simply wasn't hearing about because those people's experiences were just out of frame. On the whole, the book was keenly observed, and a solid, early example of thoughtful world-building, but not as emotionally resonant as the other two books I now consider the Cold War Zeitgeist Trilogy, and by virtue of the things it left out, it simply couldn't be, today, as pointed an examination of the human condition as it seemed evident it was intended to be. Nerd Coefficient: 7/10. It's still pretty good, but don't necessarily defer to every Best Sci-Fi poll you read online. Posted by Vance K -- cult film reviewer, Cold War aficionado, occasional book reviewer, and co-editor of nerds of a feather, flock together, since 2012. 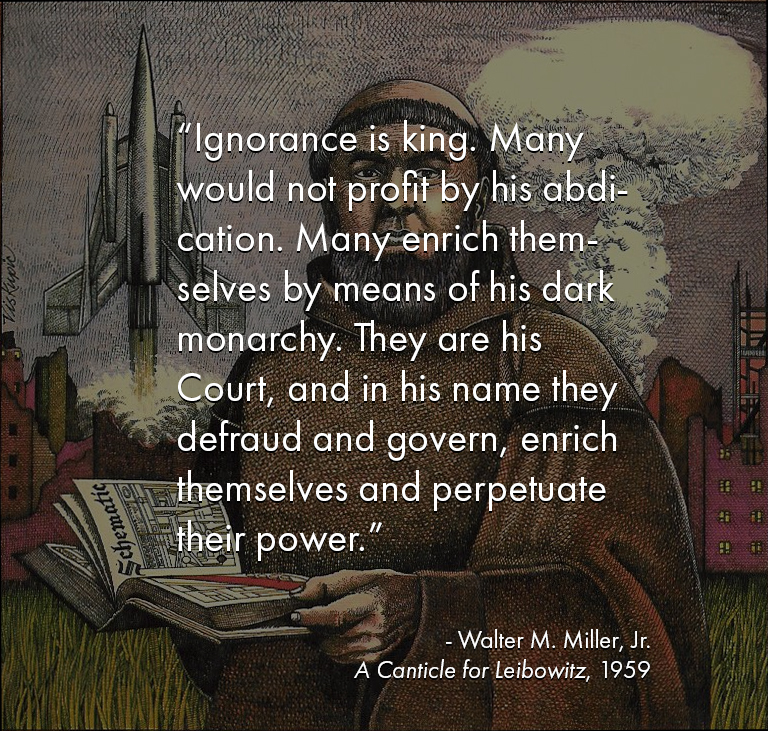 Reference: Miller, Walter M. A Canticle for Leibowitz [EOS, 1996 (Reprint)].